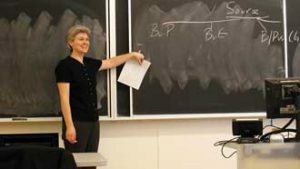 Congratulations are in order for Professor Kim Brooks of McGill’s Faculty of Law, one of 10 professors from across the country selected for Canada’s most prestigious university teaching awards, the 3M National Teaching Fellowships. While her area of expertise, tax law, might not sound so exciting, Professor Brooks’s passion for the subject is contagious. Known for her ability to keep things interesting – she even uses Bruce Springsteen lyrics to make her points in class – Brooks is habitually praised by her students for the effort she puts into keeping them engaged. Brooks came to McGill in 2007, and has received several teaching awards over the course of her academic career. Founded in 1986 by the Society for Teaching and Learning in Higher Education and 3M Canada, the 3M National Teaching Fellowships reward exceptional contributions to teaching and learning at Canadian universities. The Fellows embody the highest ideals of teaching excellence and scholarship with a commitment to enhance the educational experience of every learner. selected by this year’s judges, the Juilliard String Quartet. The silver medalist receives $4,000 and gets a performance opportunity with the Western Michigan University Symphony Orchestra. The mission of the Stulberg Competition is to promote excellence in string instrument performance by gifted young artists under the age of 20. It is open to students of violin, viola, cello or double bass. Many past winners of the Stulberg competition have gone on to become successful solo performers and key members of major symphony orchestras.